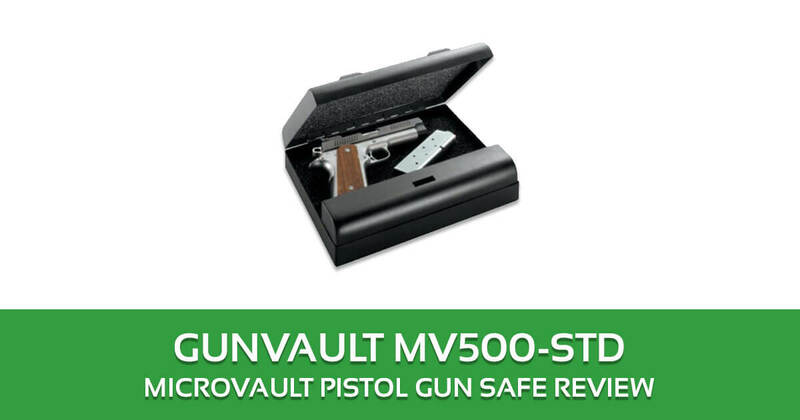 The Gunvault MV500-STD Microvault Pistol Gun Safe is regarded as a reincarnation of history’s best safety appliances. In fact, from the provided 1500-lb test steel security cable to the highly compact design, the MV500-STD was designed to make portable security simple and convenient. Since the advent of the first security, safe to ever hit the consumer market, the typical feature set of some of these things has been on the rise thereby making portable and convenient security safety a dream come true for people with valuable items. To be specific, we have come across various upswings especially in the overall design and the auxiliary features of some of these safes. Some of them include superior construction, dynamic accessibility functions and padded interior designs amongst many others. With such exceptional features, the safe has instantly become an essential addition in the home. For those who have important documents or perhaps valuable items such as jewelry or money, the robust design of this pistol gun safe makes an excellent investment for your needs. By the same token, those people that own small sized weapons which require robust yet easily accessible storage appliance will also appreciate the superior design of this safe. Furthermore, the safe is also highly portable, thereby making it the ideal investment for those who want a compact yet functional security mechanism. The MV500-STD is a small gun safe that features supplementary backup override keys to ensure you access to your safe in any event. Besides that, it also comes with a unique security cable that can be used to secure your safe to any location for added security. 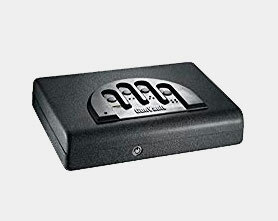 In this, one is sure that the safe is free from unauthorized access at all times and the backup override keys provide convenient access especially when you need the safe contents the most. Another exceptional feature of this cheap gun safe is that it comes with an advanced grade no eyes keypad, which is well positioned on the top section of the unit. 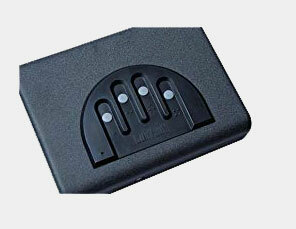 More so, this type of keypad provides easy access to the contents of the safe even when in poorly lit conditions. I liked that all the user has to do to place their fingers on the four buttons on the safe and input the unique combination for convenient access. The safe also comes with a LED and beep mechanism that indicated when the user has input the wrong combination code. This micro vault gun safe also comes with a well-built lock mechanism that performs reliably time after time to ensure that all your essential valuables are safe behind your Gunvault. On top of that, this lock mechanism is also virtually impossible to pry open with hand tools. The only two ways that one unlock this safe would be to use the backup override keys or the no eyes keypad. The manufacturer of this best gun safe also demonstrates their obsession for progression and affinity for excellence by constructing the safe using 20 gauge steel housing. This type of steel is not only ideal for high impact force resistance, but it also provides the extended functionality of the safe as well. With such a robust exterior construction housing, this safe provides optimal safety for value as one of the best safes on the market. More importantly, this safe also comes with benevolent additions such as the interior foam construction design that helps protect your delicate valuables such as jewelry from any damage. Besides that, this safe is also powered using a 9-volt battery that can provide can work for well over one year. More so, the 9-volt battery is what is used to power the safe and the beeping mechanism that alerts the user of the input wrong code. The interior foam construction has been tested for optimal impact resistance especially when the safe is exposed to immense forces. Can it be programmed with two sets of fingerprints? For instance one for my wife and one for myself? It’s not a fingerprint safe, but more of a programmable combination lock safe. To be specific, the tips of the fingers are buttons rather than scanners. The entire handprint mechanism allows users to open the safe even in poorly lit conditions. Does the safe come with a cable or any other useful locking mechanism? Yes, it does. It’s 4 inches long, and it comes with IS included. The security cable is unyielding and locks on for added safety. All the user needs to do is to strap the cable inside the safe handles and onto an another item with handles as well. All things considered, there is barely any room for poor decision-making or improvisation when it comes to protecting your valuable items such as guns. 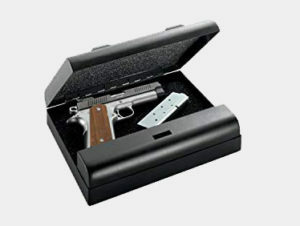 Choosing the ideal solution such as a top rated gun safe always has its inherent benefits. Simply put, an excellent safe such as the Gunvault MV500-STD Microvault Pistol Gun might be a worthwhile investment for your unique needs. This is because it comes with 20 gauge steel construction, security cable and a preferred lock mechanism that make it a highly portable security device. This safe provides the ideal value for investment with its solid performance and impressive affordability.